Nolte Küchen GmbH & Co.KG, an established kitchen manufacturer with its registered office in Löhne has commissioned a new production plant for the manufacture of kitchen worktops at their location in Melle early in 2008.The company uses shredders from WEIMA Maschinenbau GmbH in Ilsfeld for processing waste wood accumulating from the manufacturing process in the highly-automated production line.The chippings produced are used to heat up the factory. The kitchen worktops are stocked as unfinished templates up to 600, 900 or 1,200 mm wide, up to 5.60 m long and up to 5 cm thick. Cross-cutting and deep-cutting saws are used to tailor these to kitchen and customer-specific intermediate sizes. The company manufactures 1,400 worktops in a two-shift operation each day. Over 80 per cent of the worktop tasks to be carried out with great care and variance are automatically allocated to the machines (CAD). 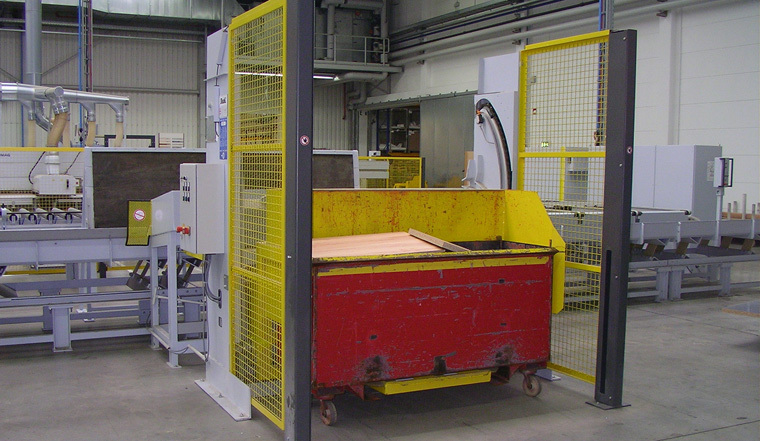 This enables optimal use of the material to be processed with a high level of automation and minimum waste wood volumes. The accumulating left-overs will be fed via various conveyor belts to a ca. 20 meter long vibrating channel and via this to a horizontal shredder of the type WLH Tiger 1300 (fig. 1) . By way of vibration, the material to be shredded enters the feed channel of the shredder and is fed to the rotor by feed rollers. There it will be shredded into chips between the rotating rotor, the rotor blades mounted on the rotor circumference and a fixed stator blade. Special blade carriers are welded in cut-in blade recesses on the circumference of the solid steel profiled V rotor. Into this the four times turnable rotor blades are screwed from the rear enabling optimal protection of the screw heads from damage and making it possible to change blades fast. The concave-shaped rotor blades ensure optimal material feed and a precise cut. The rotor blades are made of hardened steel. They ensure minimum wear when shredding the laminate-coated chipboard with its scratchproof surface. The chipping size for the optimal heating of the boiler is ca. 8-10 mm. This is determined by the screen perforation diameter of the screen basket placed around the rotor. The width of the rotor corresponds to the width of the vibrating channel thus ensuring optimal feed. The feeder is controlled depending on the load thus preventing the shredder from being overloaded. The chopped wood is homogeneously machined so as to prevent any machine blockage due to inhomogeneity. It is fed via two screws below the filter and a downstream drag chain conveyor to a rotary feeder. The feed line connected there then extracts the chopped wood and conveys it to the chips silo. The horizontal shredder is housed in a completely walkable soundproof cabin (fig. 2) ensuring quiet operation (ca. 70 dB) and good accessibility for maintenance and servicing. More left-overs are also fed via a tipping machine positioned on the side of the vibrating channel These originate from the manual work area or the reworking area where they are tipped into mobile tippers. The tippers are guided into the tipping machines, raised there and emptied onto the vibrating channel (fig. 3). Direct disposal of the processing centres Four single-shaft shredders of the same type WL 6 each with an 18.5 kW drive for direct disposal of the processing centres are also installed (fig. 4). Cuttings are inserted there in the pre-manufactured worktops and the edges glued. 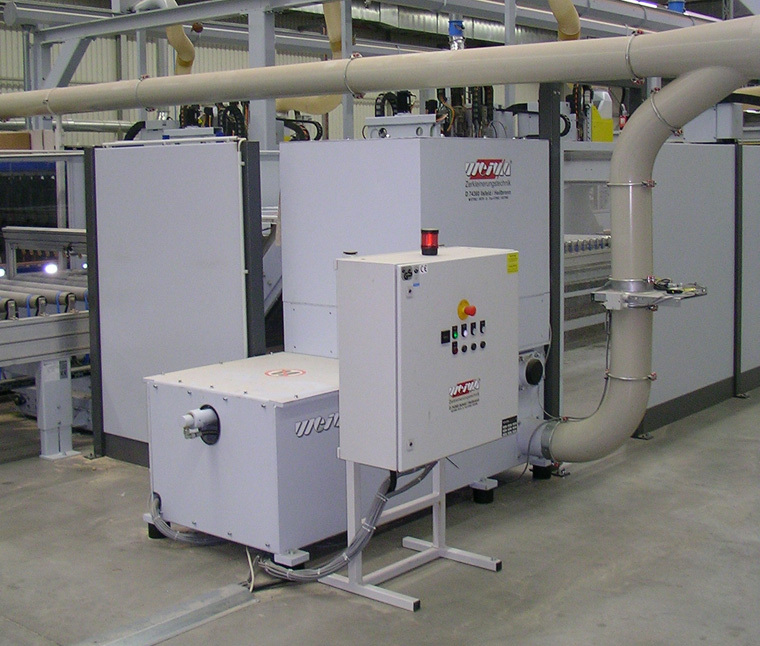 Although in two processing centres, based on the quantity of waste accumulating, the smaller WL 4 would also have sufficed, the uniform size of the installed machine brings benefits for maintenance and servicing – not least in view of the supply of replacement parts and training our own service technicians. The shredders also process conditioned large left-overs within the waste-optimized production to 300 mm x 300 mm, which are conveyed via materials handling and special hoppers into the chopper, into chippings. The choppings produced will be extracted via overground feed lines and also conveyed to the chips silo. Disposal therefore takes place directly where the material accumulates. This therefore prevents this being taken away via overground conveyor belts, which are poorly accessible, e.g., by jamming and blockages. The new design means that the additional extra handling for the machine operator is no longer necessary. The two chips silos installed for supplying the chippings provide the quantity of chippings required to generate the necessary heat for the production and administrative building including our own paint shop both in the summer and the winter. The excess will be blown into containers and made available to the other plant or sold externally. The earlier long-winded disposal via refuse trucks has been completely dispensed with due to the automated plant and the materials handling systems used. The passages interrupting the feed lines for handling the refuse trucks within production were no longer necessary thus enabling smooth operation. Mr Ralph Pollenske, Industrial Engineering: “WEIMA Maschinenbau GmbH convinced us with its concept for disposal of our new worktop production. What was decisive was our trust in WEIMA’S competence in delivering the entire installation, including conveyor belts, sound insulation, etc. In cooperation with our partners, we had an experienced partner with the appropriate references from the design up to the smooth installation including effective interface connection on the upstream and downstream installation modules and a central control system. 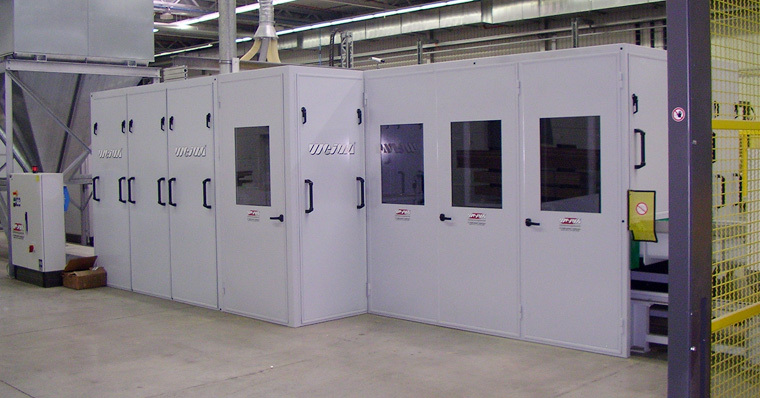 The machine builder’s registered office in Germany was, with regard to service and therefore the guaranteeing of our rational production with a high level of accessibility was another important argument in favour of the purchase. Nolte Küchen is the second largest kitchen brand in Germany and is part of the Nolte-Möbelholding (incl., flat-pack furniture and bedrooms). Nolte Küchen, production facilities spanning a total of 77.000 m² are located in Löhne, “the cosmopolitan city of kitchens” and Melle, which is 25 km away. With a worldwide sales network, its products are currently exported to 42 countries. The family business was founded in 1958 and currently has c.a., 1,100 employees.